Never Enough Nails: OPI Mariah Carey Holiday 2013 Swatches, Part 1! I finally got around to swatching the first 6 polishes from the 2013 OPI Holiday Mariah Carey collection. I've been dying to swatch these babies, but my dad is still not home (he moved from the hospital to a rehab place), so it's still been crazy around here. 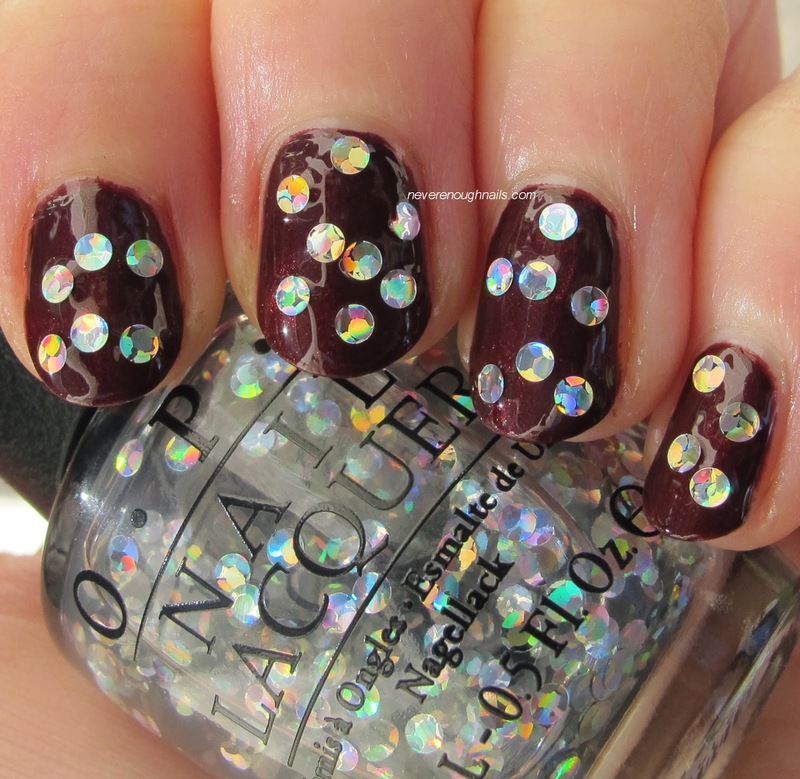 But I plan to do more swatching today, so hopefully more OPI Holiday will be coming your way soon. 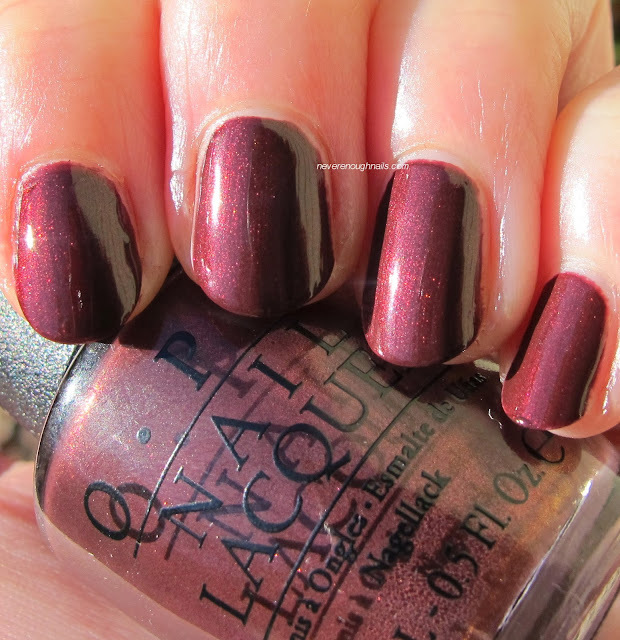 I started off with OPI Sleigh Ride For Two, a rich shimmery burgundy brown. OPI described this one as a dark hot chocolate, but I'd says it's more like a deep chocolate raspberry. There is a definitely a plummy/berry tone to it, it's not just a brown shimmer. This is two coats of Sleigh Ride For Two, it was very nicely opaque. The formula was really good as well, no complaints. All swatches in this post are topped with one coat of OPI Top Coat. Next we have the lovely OPI I Snow You Love Me over OPI Sleigh Ride For Two. This screams "HOLIDAYS" to me, it looks like an ornament! 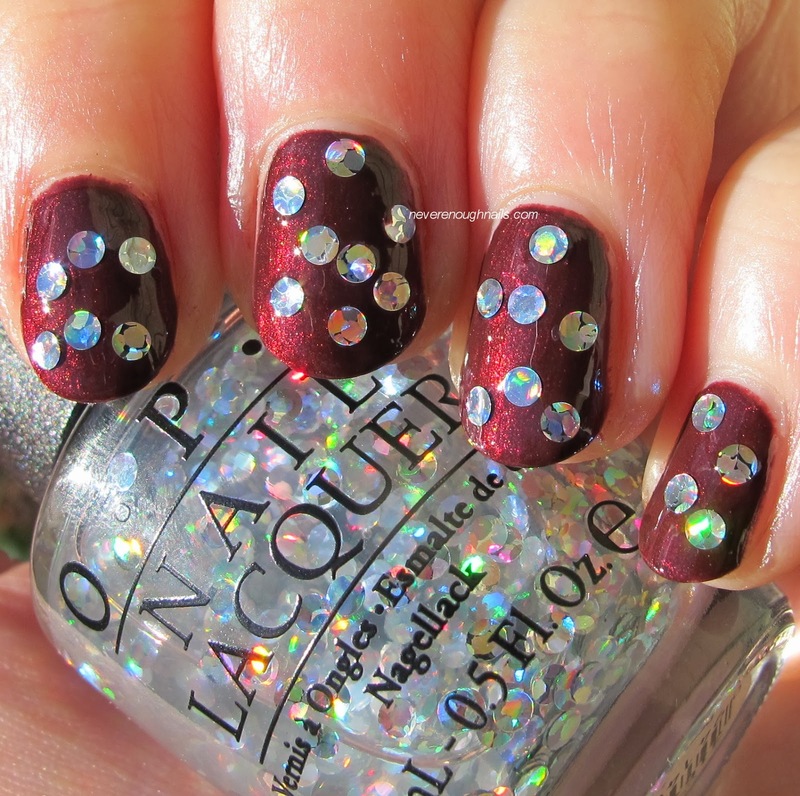 I Snow You Love Me contains large round silver holographic glitter pieces in a clear base. The glitters are completely flat, not curled or raised at all, but they look beveled somehow. It almost gives the illusion of the pieces being cut like a diamond. But don't worry, these won't be sticking up and catching on things, they do lay down quite nicely. The base of I Snow You Love Me is very very thick. I tried to paint this on like regular polish and got a giant glob of clear base and one glitter piece. To apply the pieces as shown, I wiped all of the base off of the brush and deposited the glitters on to the neck of the polish bottle. I then used the cleaned-off brush to pick up the glitters and place them on my nails. You could also use a toothpick or a dotting tool. I found the end result to be worth the bit of extra effort, but if you like to brush polish on and go, this is not really the glitter topper for you. 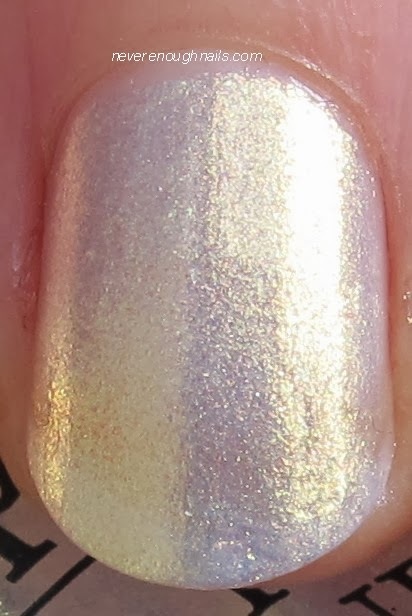 OPI Ski Slope Sweetie is an interesting white shimmer with lots of gold flash. I wasn't sure if this would be a topper or a stand alone polish, but I think it's best used alone. It's pretty dense shimmer, so I think it would hide any base color. The gold flash is very strong in person, it kind of glows on your nails. I didn't think I'd be crazy about this, but I ended up wearing this on four nails for the rest of the day after swatching it (just four nails LOL) and I really liked it! It was really interesting to look at all the time, I felt like it kept changing colors. Sometimes it had a little pink tinge to it as well. This is three coats of Ski Slope Sweetie. I think you could get away with two, but I did the third because my camera loves to make shimmers look sheer. The formula was good, not as thin as some pale shimmers like this are sometimes. OPI calls OPI Warm Me Up a "spiced coffee"... I'm kind of wondering what kind of coffee they drink over there. On me, Warm Me Up looks like a deep shimmering gray tinged with a little mauve-y brown. Not really what I would call coffee, but I love this one all the same. The shimmer is very complex, it looks like it's a ton of different colors. In my macro shot, you can see pink and maybe some blue/green shimmer. It's especially pretty in the sun, but I liked in in the shade (last picture) as well. This is two coats of Warm Me Up. It was pretty opaque and has a great formula. Very easy to apply and control. I am happy to see the shimmers being pretty pigmented in this collection (so far). I hope that continues. 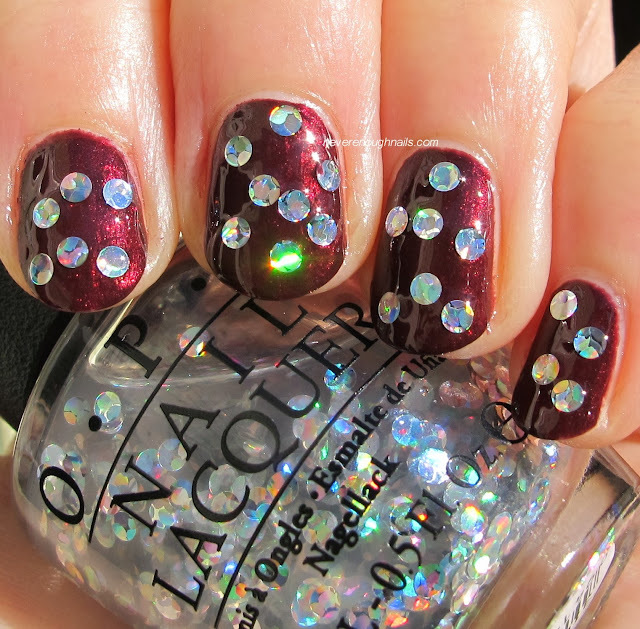 I always love to see OPI try some new and different things, like OPI Wonderous Star. The base of Wonderous Star is white gold chunky shimmer, almost like glass flecks. 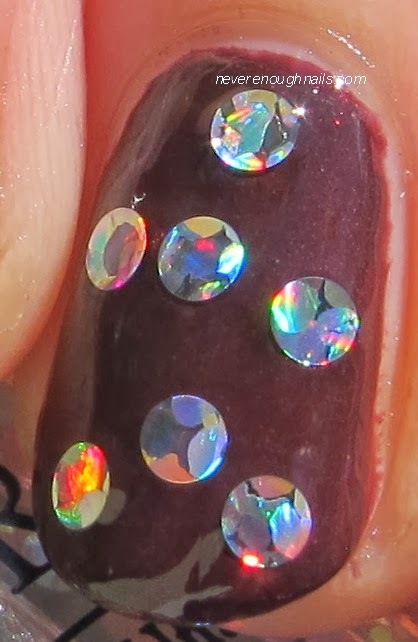 Small black hex glitter is mixed in, creating a unique look. I like this a lot, I can tell I'll wear it all the time during the holidays. It might not be everyone's favorite look, but I definitely don't have any dupes of this in my collection! This is three coats of Wonderous Star. I was actually pleased with the opacity in person, but this is the exact kind of shimmer my camera loves to HATE. You know how some bloggers can't photograph neons accurately? Or some purples? I can't photograph these chunky shimmers. My camera has a heart attack, won't focus right, and makes them look sheer. But I would be happy wearing three coats if I didn't have to take pictures of this. I didn't have to do any fishing or placement of the black glitter, I just used regular brushstrokes. OPI All Sparkly and Gold is a caramel gold full coverage glitter. I don't think this could be used well as a topper, but it will definitely be EXCELLENT for sponging over one of the many reds in this collection. This isn't too yellow-y of a gold, it leans more towards antique gold. This is three coats and there is a bit of VNL, but it's less noticeable in person than in the first three pictures here. It's more like this picture in the shade (below). The formula was good, it was pretty easy to apply. I really can't wait to sponge this over some delicious red for a nice holiday mani, but I can never bring myself to do holiday stuff until December. I guess I'll have to wait! I am really looking forward to swatching the rest of the collection, these 6 shades have me in the holiday mood now. I like how these 6 shades say "festive" and "holiday" without being the obvious reds and greens. They make nice options for when you're sick of those typical colors! My favorite from these 6 is I Snow You Love Me. Who doesn't want their nails to look like an ornament during the holiday season?! Thanks Kimberly, I have more coming up tomorrow!